If you're going to be in Austin next weekend, you are invited! Last Friday, my parent's hosted The Family Crest in their living room to around 50 people. It was a total blast. Leah Paul, my talented friend who has recently relocated to Los Angeles, joined the extended family and played a on a couple tunes (with only a 10 minute rehearsal). Fun, good music, conversation, cheese and brownies were had by all. Even my 92-year-old grandmother enjoyed herself! Not only does The Family Crest make good, crowd-pleasing music, they're super nice, respectful, helpful people as well. 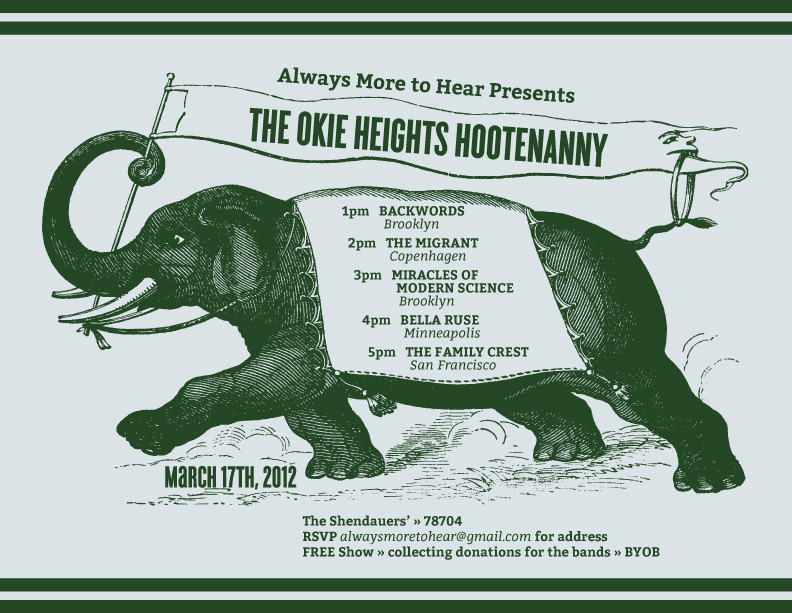 We're going to be working together again at a South by Southwest backyard party in Austin on March 17th 1-6pm. After the success of the parties I helped organize last year, we're going to do it again! This time with a whole line-up of bands coming to Austin from Copenhagen to Minneapolis. Email me at alwaysmoretohear[at]gmail.com if you'd like more info (invite and lineup above)!